Bestselling YMAA author Helen Liang was born in a very remote village in China's Sichuan province during the Cultural Revolution, where her father had been forced to relocate after graduating from University for "re-education." Her father, the legendary martial artist Liang Shou-Yu was already a famous kung fu teacher, highly educated, and one of China's top coaches. Grandmaster Liang was raised on Emei mountain, where he started training at the age of six with his renowned grandfather, Liang, Zhi-Xiang. Helen says, "I was born in that village. I didn't even go to the hospital; somebody helped my mom with the delivery. In 1994 when my dad took a demonstration team back to China, he took me to that village to see the actual room I was born in. It was old and dark. People were poor then. I also have a younger sister, but my parents sent her to my grandparents in Chongqing city, because it was so poor and very difficult to take care of two children. They wanted the best for both of us. So in Chongqing she had a much better living standard, and that's why she's a lot healthier too. I was weaker because of the facilities and the food. But they tried to provide me with the best they could." "Later on we moved to another town. I was with a whole bunch of other kung fu sisters and brothers so it was never really like I was alone. I started kung fu training when I was about four years old with my dad. He trained me every day. I remember how I would start a form each morning and I had to do it ten times. Every time you had to do it with a lot of power; my dad was very serious. You'd get really tired after three or four times, and you just don't want to do it, and he'd say, "no, ten times". He'd come over and hug me and kiss me and then go "ok, keep on going!" So I'd have to finish my form ten times every day." Helen's youthful kung fu training continued with her father until she was eight, when he had the opportunity to go to Canada as a kung fu coach. Seeing a better future for his family, he made the hard journey, leaving his family and students in 1980. He wouldn't be able to return for them until four years later. Meanwhile, he told Helen she must keep on training with her extended kung fu family. "My dad left a lot of students," she says, "and he really had been a father figure to them, so they'd hang out at our place almost every day. My brothers and sisters, and that's how I actually addressed them, would come every day and train me, just like my dad would. Ten times every day. And of course I'd do the basics, as well. They would stay at my house, and my mom would cook for them. It was like a big family." "Every day we would walk from my house to the training place, about forty minutes of walking. At that time there was no transportation, no car, you had to walk to the training area, and then walk back. But actually that was the fun part. "My dad would write back to us often, saying to my mom, 'Make sure Helen is training, and that she remembers her forms.' He put so much emphasis on it. I really missed my dad, but I was more mature. I would write to him, telling him don't worry about us, don't worry about Mom, I can take care of my mom. I would feel that my mom was lonely. And write to my dad that I was being a good girl, and not giving my mom trouble." Life went on this way for several years. Helen trained, and wrote letters to him in Canada, which seemed very far away. When she was twelve she went away to the Sichuan Provincial kung fu school, and trained there for a year. Recalling her trip to the school, she notes, "I had to travel from that small town, and basically it's two days of boat ride. Then you get to Chongqing city, and then you had to take a train from Chongqing to Chengdu. At that time, it was the capital of Sichuan. I did all that on my own. People on the boat asked me, 'Where are you going?' I'd tell them, I'm going to the kung fu school. 'Oh, kung fu, do you know somebody named Liang Shou-yu?' I'd say yes I do, he's my dad. He's very well known in Sichuan province, especially around the Yangzte river. They'd say, 'Oh, you're in trouble. Your dad is in North America, and he's not going to come back, and he's not coming to get you guys.' At that time there are all these stories about how martial artists go to North America, and they get killed, fighting with people, stories like that! It was so frightening to hear. Or they'd say he'll find another wife and never return to you. So every time I'd hear that I'd say, no no, he's coming back, but I felt angry." Helen trained at the Sichuan kung fu school for about a year, and then word came from her father that he was coming to take them to Canada. Finally, the long wait, and her fears, were coming to an end. Still, even this happy event was touched by sadness as Helen's grandfather died just before the move. "The move to Vancouver was very overwhelming," Helen remembers, "My first time on an airplane. In my small town, people hardly ever see any airplanes. Everything was very new to me. But I was young and easy to adapt to a different world." At first Helen only studied English, in a class with students from many other countries. She recalls not being afraid, just trying to speak, and how her teacher liked her. Soon she went on into high school and became a normal Canadian school girl. Well, except for being one of the top kung fu students in the country, still under the tutelage of her father who was now a professor teaching kung fu at the University of British Columbia. "I was still training quite a bit," says Helen. "I think in China going to the professional school was a good experience, but I do feel I got the most from my dad. My passion about kung fu is from him. He influences you in a way that you love this art. 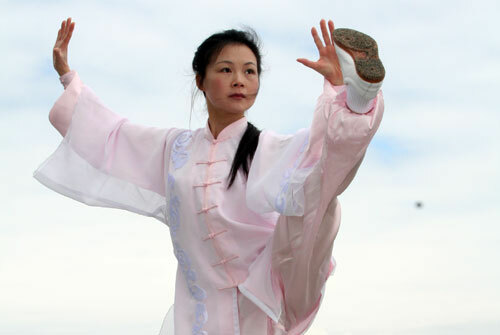 He also emphasizes the culture, and the history of kung fu, of China. He's concerned about your body's health, and doesn't push you, he's very careful, even with his students in China. He's taking care of you as a person. That's something very important. My dad would get us to read the Chinese martial arts novels, so that we don't forget Chinese, that's also important to him. We were so into those novels, every day. And that's partly how we kept up our Chinese language." With her dad as her teacher Helen made dramatic improvements in her kung fu. When she was seventeen she began teaching kids in her dad's school, and then later adults. "My life," she recalls, laughingly, "was really just school and kung fu. And my parents were quite strict about us going out. So even though I was here in the West I guess I had a very different teenage life from other kids, who go out and hang out at parties and clubs. No, none of those for me. Just training, and then come home. A lot of it's because they're worried about us. So it was very strict. But they love us very much, and we're very close as a family." Staying close to kung fu and her family, Helen went to the University of British Columbia and studied Economics there. Her parents relaxed the rules a bit, but Helen still spent many hours in the library and hanging out with her friends. The year she graduated, her father took a North American kung fu team back to China including Dr. Yang, Jwing-Ming and several YMAA students to demonstrate and tour in 15 cities. GM Liang and Dr. Yang had become friends over years of demonstrating at competitions around the world, and eventually Dr. Yang helped GM Liang publish his knowledge in several books and videos, thus beginning a long-term partnership between the Shou-Yu Liang Wushu (SYL) and YMAA.